Ramakrishna Mission Ashrama, Sharada Balgram, Gwalior, recently conducted 5 workshops for farmers under the scheme “Pandit Deen Dayal Upadhyay Unnat Krishi Shiksha Yojna” sponsored by Govt. of India. The workshop was commenced from 2 March to 31 March 2017. Farmers, who under went training by experts in the workshops, have created their groups and are experimenting these techniques in their farmlands. 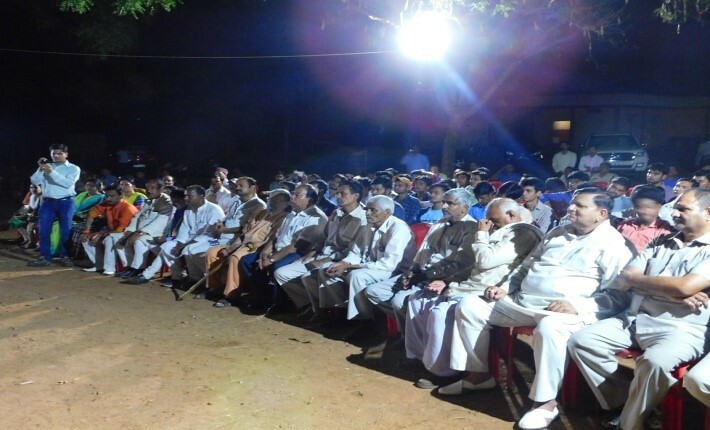 They are also creating awareness among the fellow mates regarding improved techniques of farming. 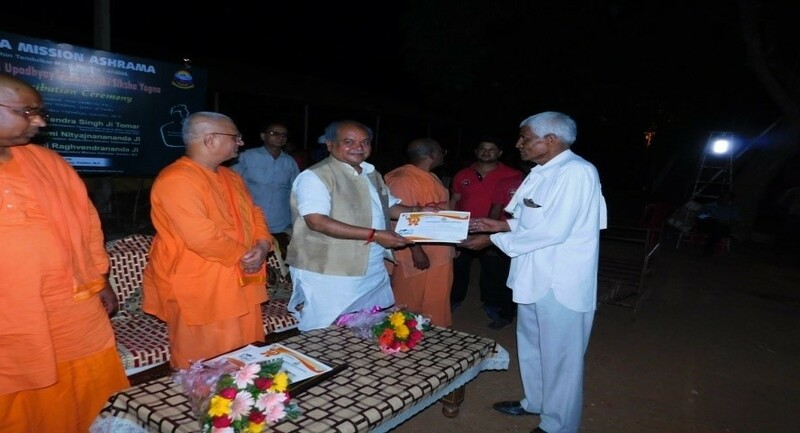 On the eve of 11 May 2017, Gwalior Ashrama organized the certificate distribution ceremony for the farmers. 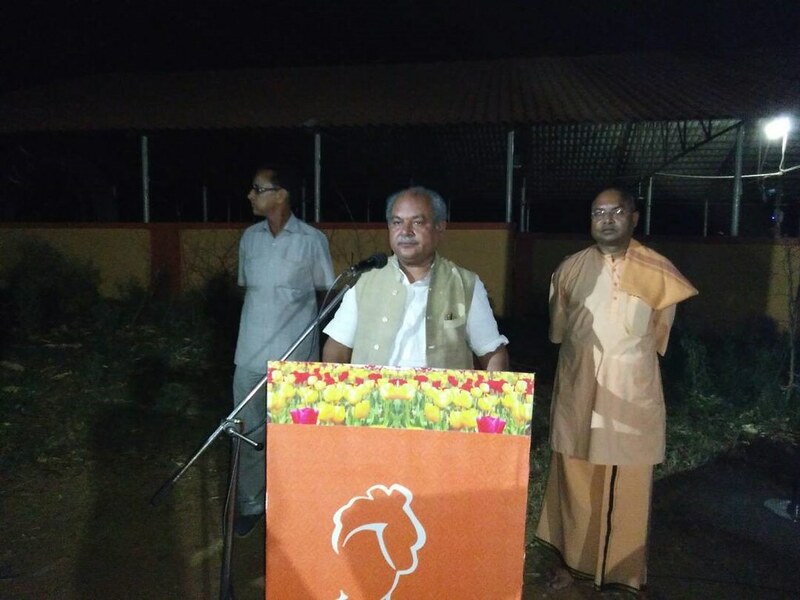 The chief guest for this event was Hon’ble Union Minister Shri Narendra Singh Tomar Ji, Rural Development, Panchayati Raj, Drinking Water, Sanitation, Swaccha Bharat, Government of India, New Delhi. 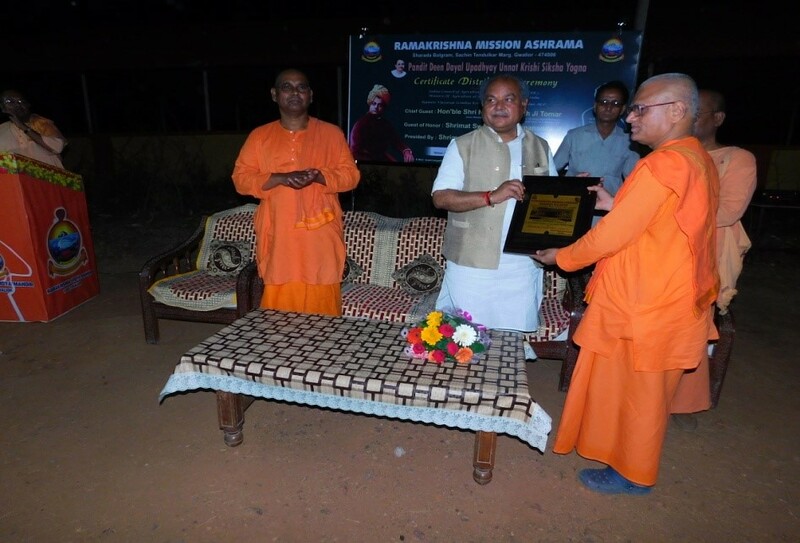 Swami Nityajnananda, President Ramakrishna Ashrama, Kathmandu, Nepal was the Guest of Honor. 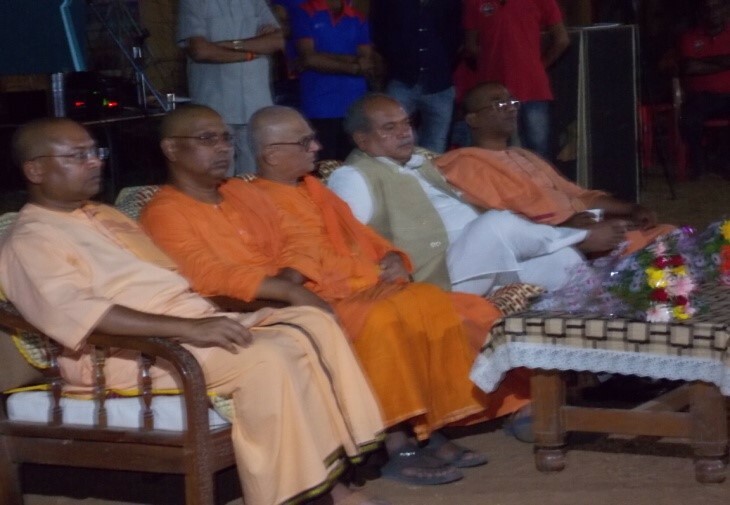 Swami Raghavendrananda, Secretary Ramakrishna Mission Ashrama, Gwalior presided over the function. The ceremony commenced by Rev. 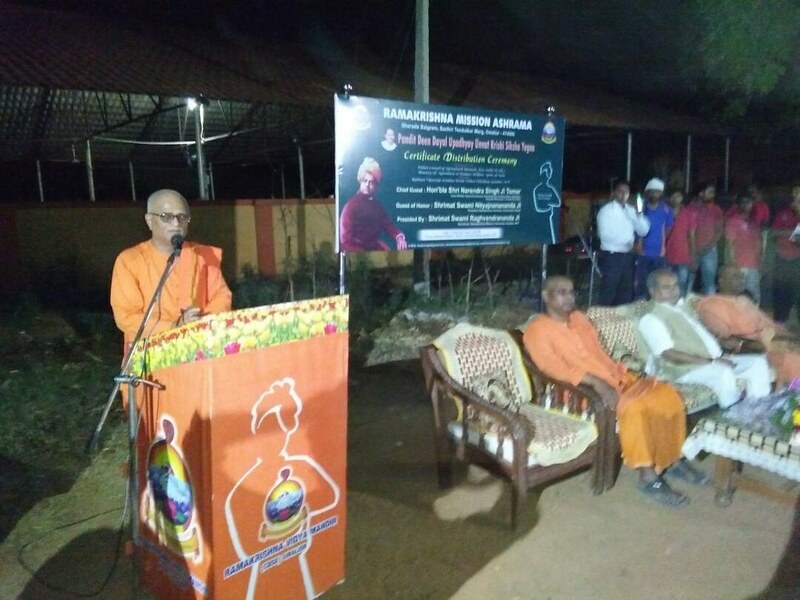 Swami Raghavendrananda by welcoming the guests. 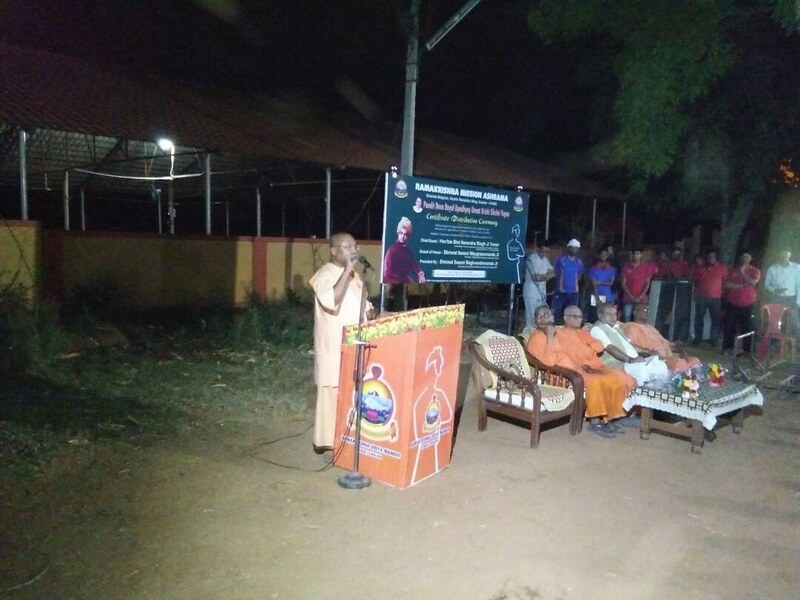 Swami Supradiptananda briefed about the workshop and explained the benefits of Zero Till farming and how it can turn the dead crust of land into fruitful land. He also mentioned about Shri Chandrashekhar Bhadsavale (www.sagunabaug.com) from Karjat, Mumbai for his 40 years of hardship behind discovery of SRT Zero Till Farming. 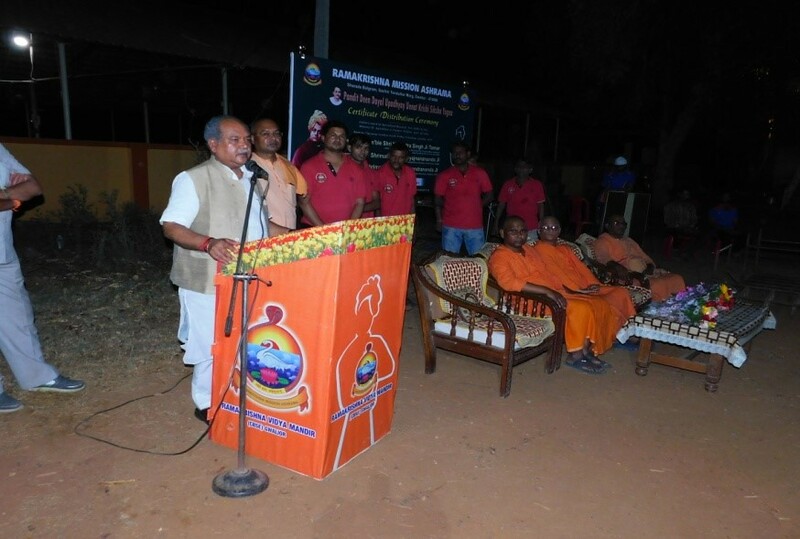 He also emphasized on the Agnihotra Homa Farming Technique which was used ages ago by our ancestors. 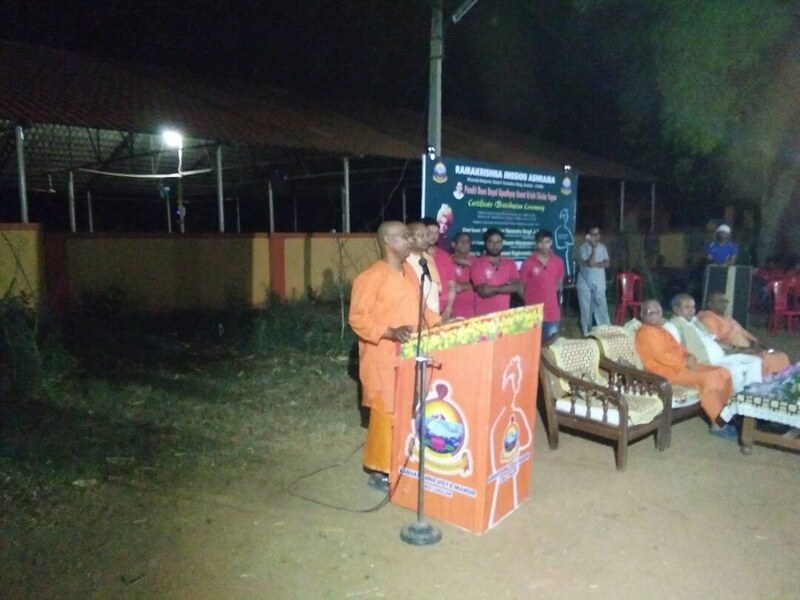 Swami Nityajnananda addressed the participants by reminding Swami Vivekananda’s words that the masses of which maximum are farmers, should be taken care of. He congratulated them and wish them good luck for their future endeavor. Hon’ble Union Minister in his speech encouraged the youth to experiment the techniques learned during the workshop in their farmlands and also help others to grow. He also emphasized that genuine farmers should enroll for the workshops so that utility of the workshops could be justified. 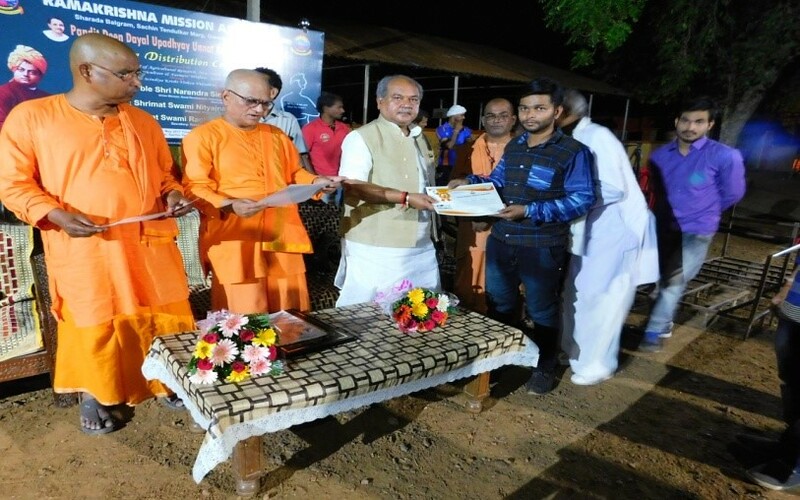 He further added that Government along with the association with Ramakrishna Mission should plan for more social reforms activities for the welfare of common populace. Among the participants, Shri Vinod Sahu, agricultural student from ITM, explained how he was benefited from the workshop and added that his fellow friends started a foundation which is creating awareness and helping farmers to learn Mushroom Farming and Organic Farming. One more participant, Shri B.L.Rana, has started experimenting advanced agricultural methods in half of his farmland. He added that government should try to encourage youths in agriculture as it is the need of time.